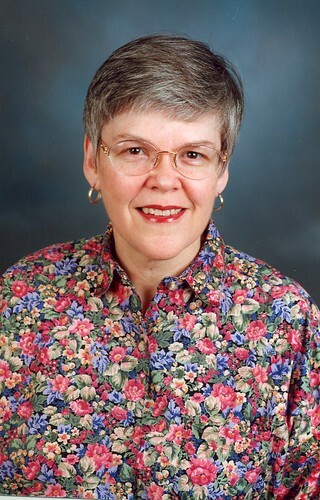 Agnes Saddington ha09 was a part-time employee on the Fort Wayne campus from 1983 to 2009. While her husband Jim taught in the classroom, Agnes worked several years each in the President’s Office, Development, and the Athletic Office. As Athletic Secretary from 1989 to 2009, Agnes went beyond her duties by serving as a friend and listening ear to the female athletes in the department. She also compiled a complete record of all athletic statistics during these years, which remains a valuable resource to Fort Wayne alumni. 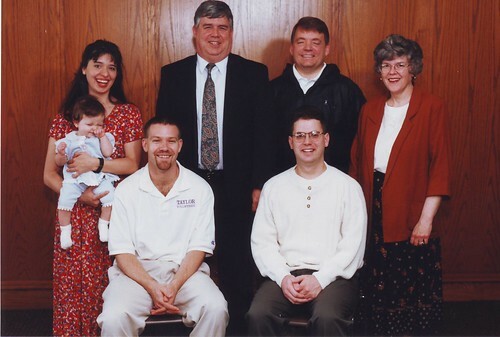 Both Agnes and her husband Jim were actively involved in students’ lives. They hosted monthly wing parties in their home for the male students of Schultz Hall, regularly attended athletic events, and lived near campus to intentionally foster relationships with students. Agnes also participated in Small Group Chapels, was a member of the Faculty/Staff Wives group, and was part of Friends of FWBC. 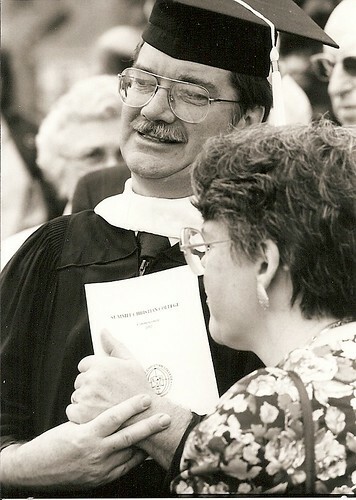 Prior to moving to Fort Wayne, Agnes attended Philadelphia College of the Bible. There she met her husband, Jim, during undergraduate studies, and they married in 1967. Together they had three children, whom Agnes raised as a full-time mom. Agnes Saddington ha09 gave 25 years of service to the Fort Wayne campus in a variety of capacities. When her husband Dr. Jim ha09 Saddington was first offered a teaching position at FWBC in 1983, Agnes proved herself a willing volunteer by helping Vicki Jacobs wrap staff Christmas gifts for no pay. She became an assistant to Vicki Jacobs in the President’s Office in 1984, a position she held for three years. In 1987 she moved to development, and two years later became the Athletic Secretary, a position she retained until May of 2009. Her devotion to the school was apparent, as her string of “part-time” jobs over the years often required full-time hours. Agnes was also active in the spiritual and social lives of the Fort Wayne students and staff. She participated in Small Group Chapels for several years, was a member of the Faculty/Staff Wives group, and was part of Friends of FWBC until it dissolved. Agnes was also active in their local church. Prior to her time in Fort Wayne, Agnes attended Philadelphia College of the Bible (now Cairn University). There she met her husband, Jim, and they married in 1967. In addition to working for the college, Agnes raised three children as a full-time mom. She also cared for her mother, who lived with the family for many years. The Saddingtons lived close to campus to remain accessible to the students, with whom they formed close friendships over the years. Agnes particularly enjoyed her position with the Athletic Department, as it allowed her to interact with the athletes on a personal level. She experienced a particularly close bond with the female athletes, who regarded her as their “sounding board.” Because most of the coaches were male, Agnes posed as an empathetic listener for the female athletes to confide in. 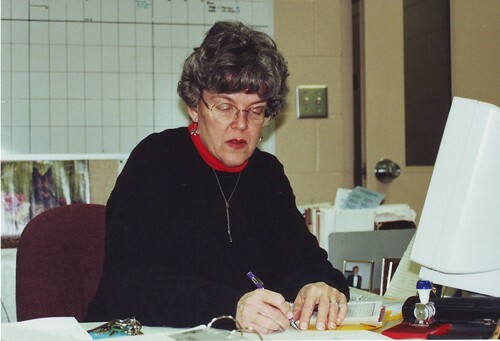 One of Agnes’ most outstanding contributions to the university was compiling all athletic statistics for the 1989-2009 seasons. The compilation includes the coaches and final team records each year in volleyball, cheer squad, men’s and women’s soccer and men’s and women’s basketball. It also includes notable events and accomplishments, including tournaments and championships played. Agnes devoted hours to this project from 2009 to 2011, and the finished product has become a valuable resource at the Fort Wayne Alumni & Friends Resource Center for alumni, both athletes and non-athletes alike. Agnes and Jim hosted monthly wing parties in their home for the male students of Schultz Hall. During these events Agnes was challenged to provide enough food for the hungry students, and she often fell asleep when they stayed late, talking with her husband. However, Agnes recalled these memories with fondness and enjoyed the lasting friendships that resulted. She and Jim have since attended many former students’ weddings and special events, and continue to do so today. Agnes currently resides in Fort Wayne with her husband, Jim, who is Adjunct Professor at the University of Saint Francis. Be the first to add your tribute to Agnes.